Take a Dubai sightseeing tour with a difference on this fun-packed, 1-hour 30 minutes amphibious land and water adventure. Board an ‘amphibus,’ commonly known as a ‘duck,’ and drive around Bur Dubai to see the picturesque wind-towers and historical creekside quarter of Shindagha. Next, splash down into Dubai Creek as your bus miraculously turns into a boat. Relax as you cruise by the Spice Souk and Deira Twin Towers, and watch the passing ‘dhows’ (traditional Arabic boats) and other vessels as your guide shares fun facts about the landmarks and Dubai’s history. Choose from the available departure times when you book. 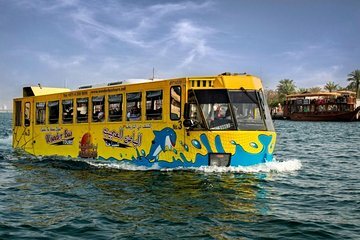 Then, meet your guide near Dubai Creek to set off on your 1-hour and 30 minutes sightseeing adventure on the amphibus — a bright yellow vehicle similar to those known as ‘ducks’ that doubles as a boat. Take a seat and listen to your guide’s entertaining commentary as you explore some of Dubai’s top sights by land. Hear how Dubai rose from a fishing port to wealthy metropolis in just a few decades following the discovery of oil in the 1950s and 1960s. Have your camera ready as you explore one of the city’s oldest neighborhoods, Bur Dubai. Snap photos of the traditional wind-towered houses and pass Shindagha Heritage Village — a recreation of Dubai’s original fishing settlement — and the Shindagha Tower, one of the city’s two old defensive watchtowers. After seeing the sights on land, get ready for splash down as your vehicle enters the waters of Dubai Creek. Then, with your bus now transformed into a boat, relax as you cruise past the Gold Souk, Spice Souk and other sights such as the Grand Mosque and Deira Twin Towers. Soak up the sight of Al Maktoum Bridge that spans the creek, and enjoy stellar views of the dhows, wooden abra water taxis and other river vessels as they chug by your window. After 30 minutes on the water, step back on dry land and bid goodbye to your guide, bringing your experience to an end. So much fun!!!! Highly recommend! I only have one problem, water was not given to us. Very nice tour but a video of the tour should be made and offered for sale. Will tell friends and family of the tour. It was a fancy ride, more like a water boat, but the only difference of transitioning from land to water, which was the wow factor. This was nice - I especially enjoyed the water tour. Interesting quick tour with a funny tour guide. On the way back from creek the guide was more interested in dance music in the bus rather than showing the sites. The trip was late starting, the impression on line was that it would take about two hours. It took 45 minutes. The ride on the Creek was nice but we could have got a creek taxi to do the same thing. On a positive note the bus was modern, we were given water in route and the tour guide tried his best to make it interesting. I think this would be better tied to one of the bus tours. The tour itself is fun and great for the kids: the tour guide was very good, getting all young children up the front to sing in to the microphone as we dodged through traffic to get to the Creek! Very clever. They let us get on the earlier tour than we booked as we were passing: but if the child is under 3 then they have to sit on your lap. Plus you must exchange your confirmation to tickets which can take a while. Finally the bus doesn't leave till its full up so felt a bit long before we left. Quando comprei achei que não seria legal, mas depois que faz o passeio é um city tur com historias de Dubai o guia muito simpático e divertido. O Barco é muito interessante.